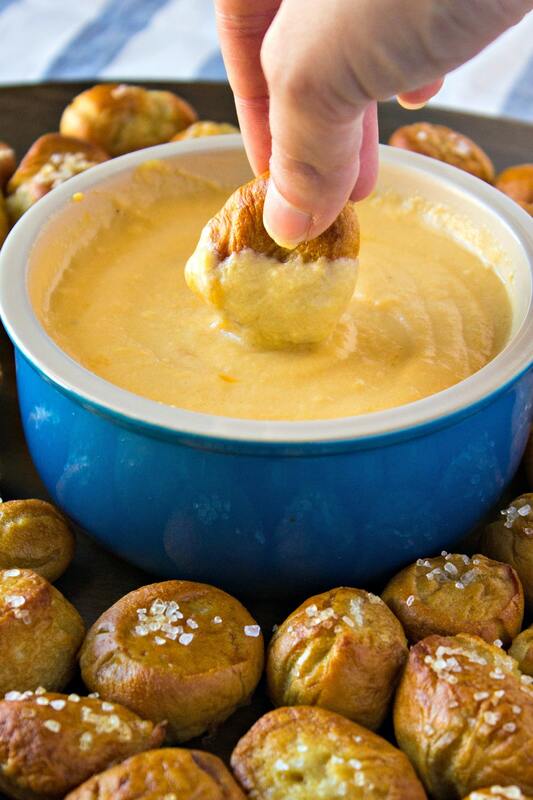 Pretzel Bites and Beer Cheese Dip – The perfect snack for your party and tailgate needs. You won’t be able to resist these soft & chewy pretzel bites and creamy beer cheese dip. The last few days have been glorious, ya’ll. I’m on vacation all week with no plans at all. So all I’ve been doing is blogging, coloring in my adult coloring book (if you haven’t heard, adult coloring is the new thing for relieving stress), and binge-watching TV. I haven’t left the house in 2 days! See, I told you it’s been glorious! Work has been so busy for the last few months so I need these lazy days for sure. But now my husband is off work, too, so I know he’s going to be stir crazy after doing nothing for 4 hours. Sadly, the lazy day may be cut short today. In these few days of laziness, I’ve been making some on my favorite treats to share with ya’ll. Today, I am featuring pretzel bites and beer cheese dip. I love making this for game days because, well, beer and cheese and carbs. Do I really need to go on??? With all the gamedays coming up (college bowl games, pro-football playoffs, and let’s not forget my favorite “gamedays” of them all…award shows!!! ), you’re gonna have ample opportunity to make these babies. The pretzels are so crispy on the outside and chewy on the inside. That’s due to the water bath we give them before baking. If you’ve made bagels before, it’s the same concept. If you’ve never made pretzels or bagels before, don’t worry – I’ll walk you through each step in the recipe below. And let’s not forget that beer cheese – the flavor is on POINT! I love the hint of beer that you get with every bite. And the texture is so perfect, too. Have you ever made cheese dip and it gets hard whenever the cheese cools?? Not this dip. The texture is smooth and creamy no matter the temperature. This dip is also great to serve with some veggies, if you want some variety. I like carrots, celery, and red pepper since they add the perfect flavors and colors. Oh and these pita chips will be PERFECT too. Make sure to use warm water for the pretzel dough, not hot water. If the water is too hot, the yeast will die and will never activate. You’ll know that it’s dead because the yeast won’t be foamy 10 minutes after the water and sugar have been added. If the dough is too sticky after you’ve added the flour, keep adding more flour, 1 tablespoon at a time, until it’s manageable. I want it to be easy to knead by hand, but if it’s too sticky, that’ll be impossible. To give the pretzels their beautiful color and shine, you have to boil them before baking. Traditionally, they are boiled in a water bath with baking soda and brown sugar. When adding the baking soda, make sure to add slowly because the reaction of the water and baking soda could cause it to overflow. When making the beer cheese dip, make sure you keep stirring the cheese while it’s over medium heat. Otherwise, it will burn on the bottom. Once the cheese is on lower heat, you don’t have to stir as often. As I’ve mentioned before, you must shred your own cheese. It will melt 1,000x easier and have much better flavor. Shredded cheese has additives to keep it from clumping in packaging. These same additives keep the cheese from melting together. It will obviously still melt but you may have some separation. If you want to keep the cheese dip hot while serving, you can serve in a fondue pot or mini slow cooker (like this one ). I hope ya’ll love this snack as much as I do! What other snacks do you love to serve during gamedays and tailgates? Let me know if the comments below. The perfect snack for your entertaining and tailgate needs. You won't be able to resist these soft pretzel bites and beer cheese dip. Add warm water to bowl of stand mixer. Sprinkle yeast and sugar over the water and gently combine together. Let mixture sit for 10 minutes until it's foaming. If there is no foam, that means the yeast is dead. This could be due to the water being too hot or the yeast being expired. Add flour and salt to mixture and stir with a dough hook until it forms a ball. If it is too sticky to the touch, add more flour, about 1 tablespoon at a time, until it is manageable. Once manageable, remove dough from bowl and place on floured surface. Begin to knead by hand for 5 minutes until the dough is soft. You can also do this in the stand mixer but I like kneading by hand so I can tell when the texture is right. When finished, place ball of dough in a large, greased bowl. Cover with damp paper towel and let rise for about an hour, or until doubled in size. Make sure to place in a warm, draft-free spot. I like to place my dough in the microwave. While the dough is rising you can prep the cheese dip. If you haven't shredded your cheese yet, do it now. Then jump down to the cheese instructions. Once the dough has risen, punch dough down with your fist. Turn out dough onto floured surface. Cut dough into 8 even wedges. Take one wedge and begin rolling into a log. Gradually increase the length of the log until it's about 12 inches long. Cut log into about 10 pieces. Set pieces aside or on floured sheet pan. Roll and cut remaining wedges. Prepare water bath for the pretzels. Place 8 cups of waters into a large sauce pan and heat to high. Once water is boiling, add brown sugar and, carefully, add baking soda. Stir to help the sugar and soda dissolve. Once dissolved, reduce heat to medium. Preheat oven to 450 degrees. Gently add pretzel bites to water. Add as many that will fit without crowding the pan. Boil for 30 seconds and then flip to other side to boil for another 30 seconds. Remove bites and place on baking sheet. When all bites are done boiling, beat egg with 2 teaspoons of water. Brush mixture over each pretzel. Sprinkle each pretzel with a little coarse sea salt. Bake in preheated oven for 12-15 minutes until golden brown. Let cool for 5 minutes before serving. Serve with beer cheese dip and veggies. In medium saucepan, whisk eggs, evaporated milk, Dijon mustard, Worcestershire sauce, and half of shredded cheese. Place on medium heat until it begins to warm up. Add amber beer and cornstarch mixture. Whisk quickly until completely incorporated and cheese has melted. While whisking, slowly add remaining cheese. Keep whisking until it has melted completely. Cook sauce until it thickens, about 10 more minutes. Place on low heat until ready to serve. Recipes for the pretzels and beer cheese dip adapted from The Kitchn. Looks awesome! If I wanted to make the pretzel bites a day or two ahead, how would you recommend storing them? SO that’s tricky…the salt on the pretzel will eventually get absorb after a day so it will make the pretzel bites look lumpy on the surface. I think you best bet is making the dough ahead of time, cut the bites, and then freeze until you need them. Then just boil them and bake, as directed. Let me know how they turn out! Just when I wanted to start my diet…these look so yummy. these sounds amazing! what a great app for Super Bowl! Nom nom! These look so good – must try. Thanks for sharing!! This looks like my new favorite food! Pinning! I’m salivating right now as I write. This look so delicious. Pretzels and beer cheese sounds like something I want to make. Like right now!!!!! Thank you for sharing. Can’t wait to have this on the table. This looks amazing! I love homemade pretzel items, they are the best! Soft pretzels are one of my favorite things EVER. I can’t wait to give this a try! I have never attempted pretzel bites, but I love them! Definitely pinning this to try later. They look amazing. These pretzel bites look absolutely amazing and a recipe I know I\d love! Thank you for sharing your great recipe, I can’t wait to try it! Those pretzel bites look so yummy! They remind me of the pretzels I used to get at Oktoberfest when I lived in Germany! Oh awesome! What a compliment! These look amazing (as do your photos) .. I’m going to add them to our New Year’s Eve party menu. Thank-you so much for a great recipe! Thanks so much for the sweet feedback! You had me at pretzel. But seriously this looks so good! Yum! This would definitely be the hit of any party! These look delicious! Great appetizer idea! Yummm! I don’t know if I have it in my to do the pretzel bites, but that dipppp!!! oo haha this seems so yummy! This sounds amazing! I had a beer cheese soup once, and it was delicious, so I can only imagine how fantastic this recipe is. Thanks for sharing it! I can’t wait to make it! Ah, they look so good and that dip! Yummy! This looks like absolute cheesy perfection! Definitely making this for our New Year’s Eve Party! This recipe sounds so great! I really love all your pics, such great lighting. I’ll definitely have to try this one out! Thanks so much, Mallory! That is so nice of you to say! These look like the ultimate snack to have while watching a game with my man! I make pretzel bites all the time but these dip to go along with them would put them over the top. Football weekend I will be making this.